Jubilee Debt Campaign’s manifesto for the 2015 general election. Over the last forty years, the removal of regulations on lending has driven devastating debt crises affecting people on every continent. The Latin American and African debt crises of the 1980s and 1990s were followed by the East Asian Financial crisis of the late 1990s, the Russian and Argentine defaults at the turn of the century, and the European debt crisis in the late 2000s. Failure to cancel unjust and unsustainable debts continues to increase poverty and inequality around the world. Large debt payment burdens have dramatic impacts on poverty and inequality. Debt crises in the 1980s, 1990s and 2000s caused two or more ‘lost decades of development’. In sub-Saharan Africa, the number of people living in extreme poverty (on less than $1.25 a day) increased from 205 million in 1981 to 330 million by 1993. Following global campaigning against the injustice of developing country debt, $130 billion of debt has been cancelled for 35 countries through the Heavily Indebted Poor Countries (HIPC) initiative. This has saved billions of dollars every year, and led to millions more people having access to healthcare and education. However, many developing countries were excluded from this scheme because they were considered ‘not poor enough’ or ‘not indebted enough’, and others that benefited from the scheme once again face punitive and unsustainable levels of debt. Today, countries across the global South continue to suffer from high debt payments. Countries particularly affected include Jamaica, El Salvador, Pakistan, Tunisia and the Philippines. Furthermore, we are now witnessing a new boom in lending to developing countries. External loans to low income countries increased by 75 per cent between 2008 and 2012. Loans to sub-Saharan African governments more than doubled over the same period of time. This threatens to create new debt crises, once again plunging countries into crisis and increasing poverty and inequality. Under current rules, loans can be counted as aid if interest rates are 7% or less. Several governments give large proportions of bilateral aid as loans, including Japan, France, Germany and China. These loans have increased in recent years. The UK does not currently give bilateral loans, but the current government has adopted a policy of being able to give loans on a case-by-case basis. This will contribute to the boom in lending which is already taking place, further increasing the risk of debt crises. No such loans have yet been given; we are calling on the new government to keep giving grants rather than loans. The UK government does make large aid contributions to multilateral institutions such as the World Bank and African Development Bank, which are then given as aid. 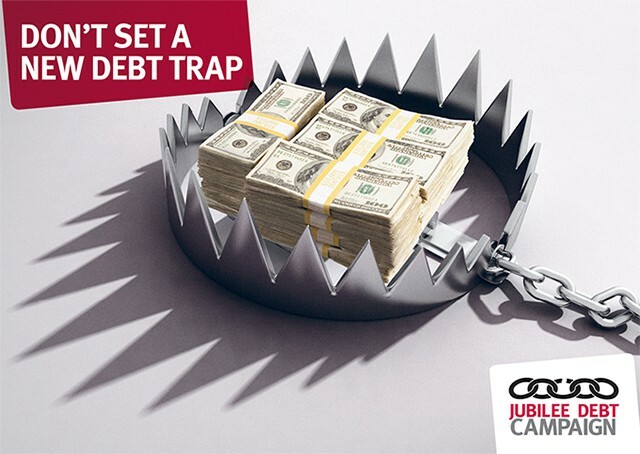 Jubilee Debt Campaign estimated in 2012 that $1.26 billion of UK aid money was given to multilateral institutions to then be used as loans. This was the second highest amount of any OECD country, after Japan ($2.23 billion). Around half of lending to the most impoverished countries is by multilateral institutions such as the World Bank. One reason developing country governments are dependent on foreign loans is because of the large quantities of revenue they lose through tax avoidance and evasion. The OECD has estimated that developing countries lose three times more money to tax havens than they get in overseas aid. As a major financial centre, the UK government has a responsibility to ensure its policies help developing countries receive more of the money due. However, in recent years policies implemented by the UK government have actually made the situation even worse for developing countries. The Controlled Foreign Companies rules have been changed so that they no longer deter tax avoidance by UK companies in third countries. Instead, the rules now offer an incentive to UK companies to maximise their use of offshore financing transactions within their own company, because of a 75% tax break on the profits from these transactions. Ensure that every tax rule and treaty adopted by the UK government should have a spillover analysis to check that it won’t harm developing countries, but actively help them in tackling tax avoidance and evasion. Low interest rates and quantitative easing in the Western world are fuelling a private lending bubble to developing countries. Open capital markets mean money can be borrowed at low interest rates in the West, and lent on to developing countries. Furthermore, the current system of responding to debt crises incentivises the private sector to lend recklessly. The IMF and other institutions (such as the EU or World Bank) lend more money to countries in crisis, bailing out the original reckless lenders, whilst leaving the country in debt. When debt relief is finally agreed, for example through the Heavily Indebted Poor Countries initiative, it is the public sector which bears the cost. Instead, a fair and transparent debt workout process, independent of lenders and borrowers, would indicate to lenders that they would have to be involved in debt restructurings. This would incentivise private lenders to be more responsible, thereby reducing the frequency of debt crises, whilst also protecting the public sector from the costs of more bailouts. In September 2014, the UN General Assembly voted to create a legal regulatory framework for the sovereign debt restructuring process, by 124 votes in favour to just 11 against. This extremely welcome move means there is now a process at the United Nations to create such a resolution mechanism. Appalling, eleven countries, including the UK government, attempted to block these negotiations from even beginning. The UK government should now constructively engage in the process to create a fair, transparent and independent process for resolving sovereign debt crises. 4) Require all lenders funded by the UK, including UK Export Finance, the World Bank and IMF, to sign up to responsible lending guidelines, including public scrutiny of loan terms before contracts are signed. For lending and borrowing to be more responsible requires greater accountability to people in the countries concerned. One common call of groups we work with in the global South is for all loan contracts to be made publicly available for scrutiny before they are signed, and for contracts to require the agreement of elected parliaments. Lenders can help facilitate this process by making contracts publicly available, and requiring parliamentary approval. However, UK Export Finance for example, does not release any information on loans it guarantees until up to a year after a deal has been agreed, and then refuses to release details of the contracts. 5) Support the creation of a debt relief scheme for Small Island Developing States to help countries out of the current debt trap, and create greater protection against future natural disasters and economic shocks. One set of countries in particular need of debt relief are Small Island Developing States, including Jamaica, Grenada, Antigua & Barbuda, Samoa and Tuvalu. The Jamaican government’s foreign debt payments have cost over 20 per cent of government revenue for the past 25 years, and are currently 28 per cent of revenue. The cuts in health services in response to this debt crisis has meant that maternal mortality has doubled over the same time period, whilst the proportion of children completing primary school has fallen from 97 per cent in 2010 to 73 per cent today. Common economic shocks which have hit many Small Island Developing States in recent years include the loss of trade preferences to the EU, natural disasters, particularly hurricanes and typhoons, and the 2008 Western banking crisis, which has reduced tourism revenues. This means many such countries are stuck in a debt-austerity trap of high debt payments, low economic growth and declining standards of public services. Whilst they notionally have a higher GDP per capita, Small Island Developing States’ dependence on imports and exports and vulnerability to negative changes in costs of imports or revenue from exports means they share many features in common with Heavily Indebted Poor Countries. 6) Hold a public audit into debts owed to UK Export Finance, cancel those from unjust deals such as loans for arms sales to now deposed dictators, and use the audit to adopt standards to prevent such deals being supported again in the future. Around $2 billion is still owed directly to the UK government by developing countries, mostly to UK Export Finance. These debts come from loans guaranteed by UK Export Finance for other governments to buy British exports. When the loans were defaulted on, UK Export Finance paid off the original lender, and then took the loans on themselves. 74% of Indonesia’s debt comes from loans for the former regime of General Suharto for military equipment, including Hawk aircraft and Scorpion tanks, which were used against the Indonesian people. Despite General Suharto being toppled from power, the debts are still being paid. 56% of Ecuador’s debt comes from loans to various military dictators for military equipment. Loans for arms to dictators are also owed by Iraq (to Saddam Hussain for a chemical weapons factory and other arms sales), Egypt and Argentina. The government of Norway has held a public audit into similar export credit-related debts owed to it, and cancelled debts owed by five countries (Ecuador, Egypt, Jamaica, Peru and Sierra Leone) for projects where it was known the exports concerned would be of no benefit to the people of the countries receiving them. The audit has been used to help set standards for more responsible Norwegian lending in the future. The Transatlantic Trade and Investment Partnership (TTIP) is a free trade agreement being negotiated between the EU and US. It could have large implications for how various industries are regulated, including making it harder to control banks and preventing debt and financial crises. Of major concern is the risk of creating a new international financial crisis. Rules are being proposed for the agreement that would prevent either the EU or US from bringing in regulations on banks. This includes preventing regulations such as controls on lending, bans on the use of toxic financial instruments and ‘capital controls’; measures which regulate the lending of money between countries. In the aftermath of the 2008 crisis the US has actually been more active in re-regulating banks, but there are fears in the US that these might be removed in order to come back down to EU levels of laxity. The UK government should oppose the adoption of the TTIP agreement, and start supporting greater regulations on banks. This includes adopting credit controls on banks, as existed in the 1950s and 1960s, limiting the total amount of bank lending, and how much can be used for speculative activities. The UK government should also support the right of countries to introduce capital controls – any kind of measure which regulates lending between countries – and the removal of articles from trade agreements which prevent the introduction of such regulations.